(CNN) -- Oil giant Exxon Mobil Corp. plans to sell its company-owned gas stations, saying they aren't profitable enough even with gasoline selling at $4 per gallon. The 2,220 stations make up about 1/5 of the Exxon and Mobil stations in the United States. The nation's largest oil company, which earned nearly $41 billion last year, says it will sell more than 2,000 stations over the next few years. "The fuels marketing sector is a very challenging market," ExxonMobil spokesperson Prem Nair said, adding that the company is feeling particular pressure from hypermarkets like Wal-Mart that sell gasoline. ExxonMobil plans to sell 820 owned and operated stations as well as 1,400 stations leased to dealers. 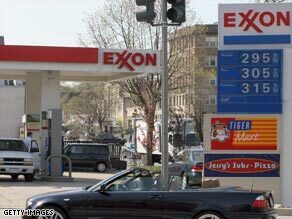 The 2,220 stations make up about 1/5 of the Exxon and Mobil stations in the United States. The company says the stations to be sold will continue to sell ExxonMobil product. "As the highly competitive fuels marketing business in the U.S. continues to evolve, we believe this transition is the best way for ExxonMobil to compete and grow in the future," said Ben Soraci, U.S. director of retail sales for ExxonMobil. Poll: What causes high gas prices? The states with the largest number of ExxonMobil-owned stations are California and New York, each with more than 200. ExxonMobil also has a large concentration of stations in Texas, Florida, Maryland, Tennessee and Virginia.